Philippine performance and installation artist Mideo Cruz has been distinguished for his provocative multi-disciplinary interventions straddling the irreverent, the blasphemous, and the subversive. While Cruz has raced through a range of discourses from colonialism, globalization and Third World realities while charting his journey, Deities, his latest one-man exhibition at the Galleria Duemila in Manila, seems to be the artist's move to step on the brakes a little bit, sit back and savor the view along the road. 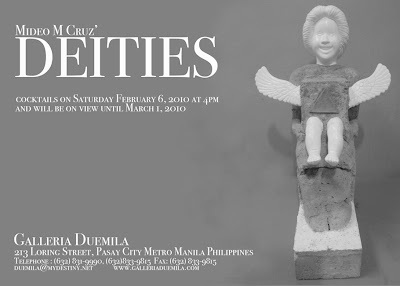 Deities features Cruz's constructed collection of hybrid idols: found objects reproduced utilizing plaster of paris, concrete, and industrial paint. 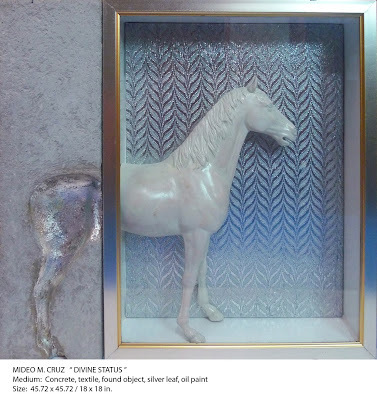 Rather than representing idols as mystical objects to be revered, Cruz deconstructs and offers them as homages to fallen gods and effigies of the sacred, steeped in modernity and profaned. A thematic and formal shift in Cruz's artistic trajectory is evident in the show. Deities, for instance, presents more sculptural and permanent works—a fresh departure from the mostly transient and site-specific installation and performance pieces that comprised his earlier projects in the United States as a recipient of residencies and fellowships from the San Francisco-based Headlands Center for the Arts and the Asian Cultural Council, respectively. Intentionally antiseptic, the sculpture-installations in this show forgo the multiplicity of complex structures, screaming symbols, and jarring colors that usually marked the flavor of Cruz's earlier body of works. Instead, the artist makes full use of minimalist lines, the muted textures of concrete, and stark white paint--a visual sensibility once put to full effect by Cruz in Banquet, a performance-installation on gluttony and bourgeois hegemony back in 2006 and revived in this collection. 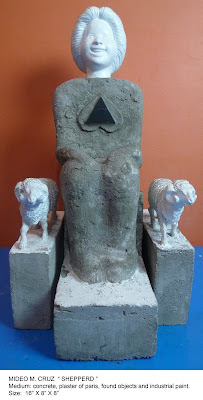 The show is the artist's personal reflection on the development of deities between different civilizations. While Cruz's earlier body of works dealt with strong historically and socially-situated thematics on issues current and urgent to the point of volatility, this show seems like the artist's attempt to dwell on the less exigent aspects of contemporary gods. In constructing and representing modern-day idols, Cruz attempts to situate their symbolism in the visual traditions of earlier civilizations and draw out parallelisms and contradictions within their spheres of meaning. For instance, his representations of Mother and Child figures (a theme replete in Catholic iconography) also allude to symbols and shapes associated with earlier pre-Christian cultural traditions. Yet for all their comparative mutedness, Cruz's works retain much of the frank spirit of iconoclasm that marked his earlier engagements. Liberally mixed in his pantheon of deities are popular icons spawned from this era of hegemonic globalization and watersheds in modes of production: the ubiquitous smiling head of a global food conglomerate's mascot reproduced many times over, the stray figure of Dolly the cloned sheep, and other contemporary deities of mass consumerism. Despite the visual and stylistic departures from his usual repertoire, but, thematically, the show is a progression or continuation of the discourses that Cruz has consistently engaged and interrogated as a visual artist: the acts of confronting and questioning the gods of our times. Deities runs from 6 February to 1 March, 2010 at the Galleria Duemila, Pasay City, Manila, Philippines. For more information, please contact, Ms. Catherine Huit of Galleria Duemila through Tel. No. (632) 831-9990 or Telefax (632) 8339815, e-mail: duemila@mydestiny.net or visit the website at www.galleriaduemila.com. The gallery is located at 210 Loring Street, Pasay City.